Most of the supplies I used for this project are linked in the list at the bottom of this post. This Happy Haunting stamp set is perfect for scenes. You can use the stamps for Halloween cards but not only! I also LOVE the tiny sentiments in this set (happy, you are amazing, for you, wishes). They are so versatile. 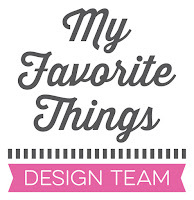 They can be used for so many projects and occasions. The moon and Superman were colored with Copic markers. The sky was sponged with Distress inks. I die cut the panel using the Mod Square STAX Die-namics. I attached the panel with foam pads to a top-folded card base that I made with Daffodil cardstock. I finished off my card by adding a layer of Wink of Stella clear glitter to the moon. It sparkles beautifully! 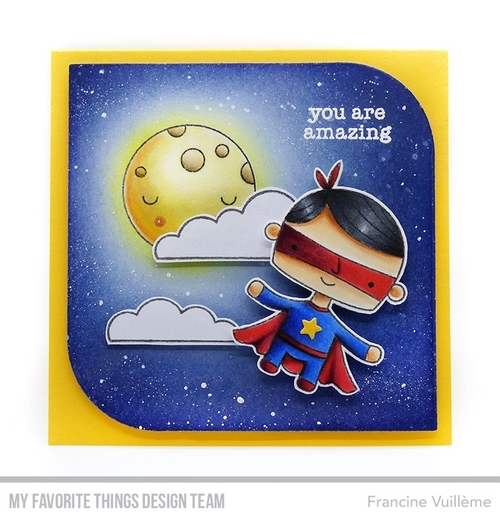 You are so clever, Francine...such a CUTE card!!! Love your galaxy background and how you played with all these great colors! Love this card! What wonderful a Supper Kid! You've out done yourself- the gorgeous over the moon card is perfect for special people who you might also give one of the adorable treat bags! I had to chuckle when I saw your card with the Swiss cheese moon! With my own Swiss heritage I immediately recognized what you did. Loved it! ALL your cards are inspiring, creative and unique. What an adorable little superman. Very cute. This is such a delightful card. Thanks for sharing it. I love your superhero card. The colors and shading are awesome. Thank you for sharing. The little boys (and BIG boys) I know would love getting a card like this. Great job, and thanks for inspiring me.